w10.5 x h12cm. 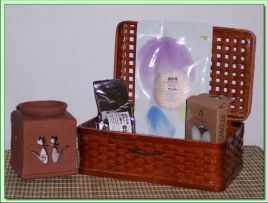 This attractive incense burner kit comes complete with a ceramic burner, incense candles, and a variety of incense teas to try all packed in an attractive glazed wicker box. Makes a really unique gift.